DeAnn has tremendous heart. 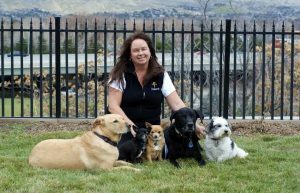 The dogs shown in the photo with her are all rescues that came to her and her big-hearted husband, Rich, in various ways. Some were inherited from family members who passed away and some were from shelters. Each of them gets great loving care in their home. One Christmas, Rich gave DeAnn the most wonderful gift of all…a 9 year old black lab named Missy. Missy was at the Meridian Animal shelter. Rich knew that Missy might not make it out alive since she was old and had many health problems. It would take a special family to adopt her…theirs! Missy spent the last two years of her life in the comfort of DeAnn and Rich’s home. She got the best vet care and food. She was greatly loved. Not only do DeAnn and Rich’s dogs enjoy the best care, they also get loaded up in the Subaru every day and head for the hills where they get their daily hike. The dogs really look forward to riding in the car and running free every day. DeAnn shares the same care and compassion with client pets in her care. She is trustworthy and caring. DeAnn and Kathleen often share jobs, making a great team that our clients love.